The boss slipped me this CD when I got the opportunity to appear on Rough Edge Radio. Unfortunately, I packed it up and moved a few states away. Now I've unpacked and had a chance to spin it. 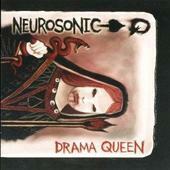 I might have been too late, Neurosonic have called it quits according to their MySpace page. The music these Canadian guys create is really good. They have a 311 sound but also slosh some pop music in to make the mix unpredictable and that's what keeps you listening. There is some gritty guitar and that always pleases me. I need an axe that chops down a song, not one that sits behind a glass case with the plaque shiny and untouched stating "Use Only In Case Of Emergency." These guys spent some time on tour with acts that Korn likes to promote; the second stage is generally for up-and-coming bands and you can usually catch some awesome bands. I'm sure that Neurosonic impressed a bunch of people when they played. "Me Myself And I" has some sweet acoustics and the guitar when unplugged sounds great. Along with nasty guitar to power the other songs I'll will have to elevate the vocals, most notably the harmonies. You can hear a lot of Saigon Kick squelching through your ear buds, which is my recommendation for listening. You can also punch this rock outfit through your car speakers (crack the windows, though, and look for second glances). The lyrics are smart alec and right up in your freshly shaven face. In fact, the first song garnered some backlash. Pete Wentz from Fall Out Boy was rumored to say that he didn't like the reference to his wife Ashley Simpson in "So Many People." Whether or not it ever got to a hot debate remains unclear. There is enough guitar to keep the moderate listener satisfied and the pop element does come in at odd times but it blends together well. I guess since this is the first and last album you won't see any more from them but I'm sure this talented bunch of Canucks won't go away but instead go in different directions. Good luck guys, and thanks for the music! Neurosonic: Jason Darr - lead vocals, guitar, bass, piano; Troy Healy - guitar; Mike Wall - bass, backup vocals; Shane Smith - drums; Cassandra Ford - backup vocals. For more information, check out http://www.myspace.com/neurosonic. Copyright © 2010 by R. Scott Bolton. All rights reserved. Revised: 02 May 2017 23:02:43 -0400.